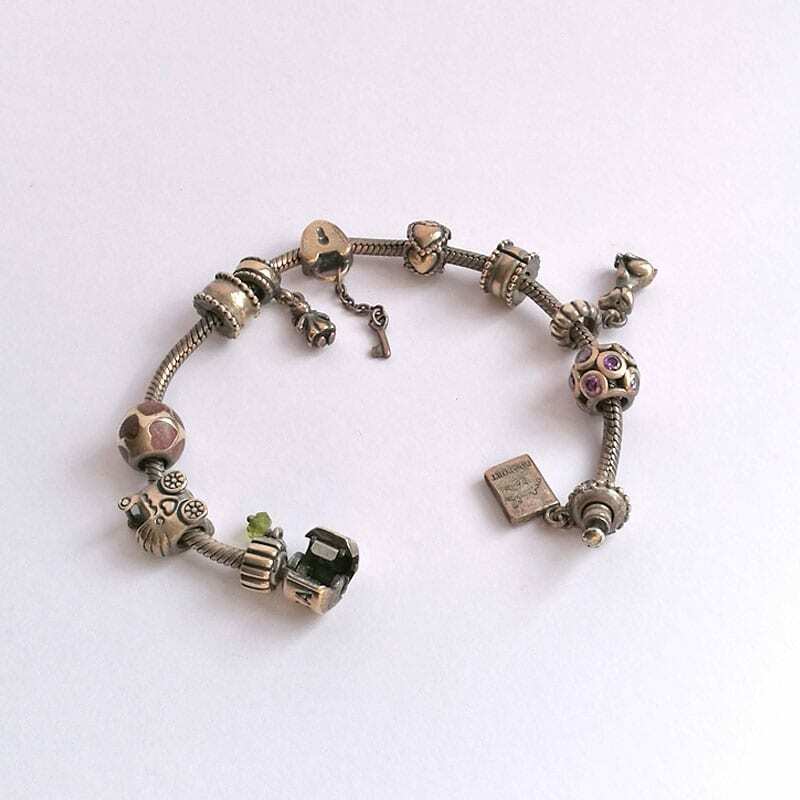 Around 18 months ago, an little incident occurred in relation to my much-loved Pandora bracelet. Having worn the bracelet every day since I received it as a gift from my husband, I didn’t pay any thought to removing it before going swimming with my daughter. It wasn’t the first time my lovely bracelet had come into contact with water, since I’d kept it on my wrist whilst swimming before. However, on this particular day, I think I must have visited the most heavily chlorinated swimming pool in the whole of the UK. When I got out, I realised that the chlorine in the water had totally ruined my bracelet, turning it from bright and shiny to horribly dull and dirty. I was rather mortified and tried everything I could think of to remove the tarnish, before failing miserably. I hid it away for some time, until my husband noticed I wasn’t wearing it, at which point I had to fess up. Here’s what my bracelet looked like after the swimming pool incident! Not great, right? 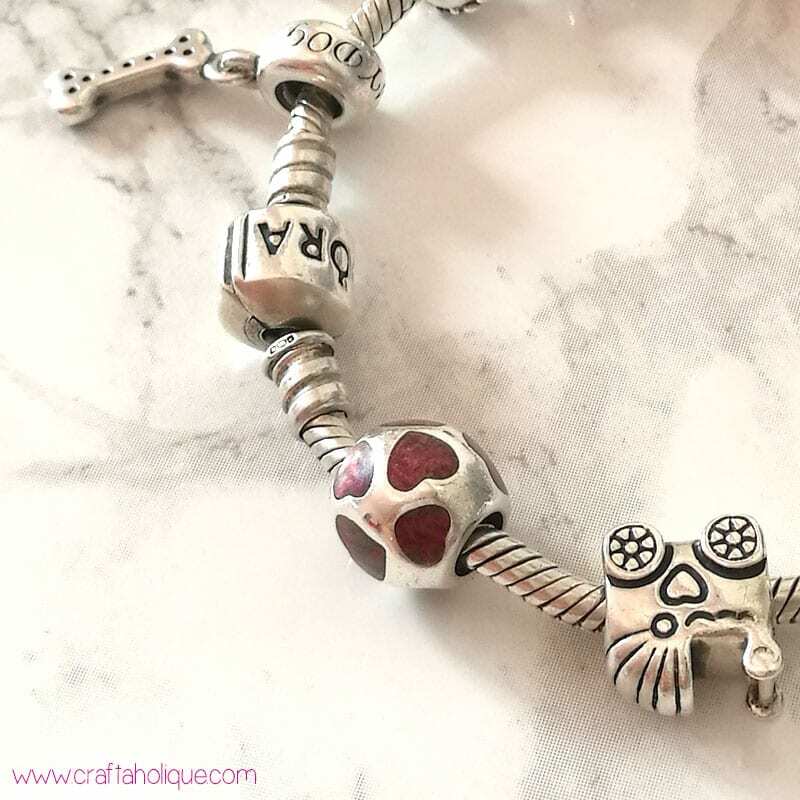 Each one of the charms had been bought for me as a gift to celebrate a special occasion or memory, so I was totally gutted to have ruined it like this! 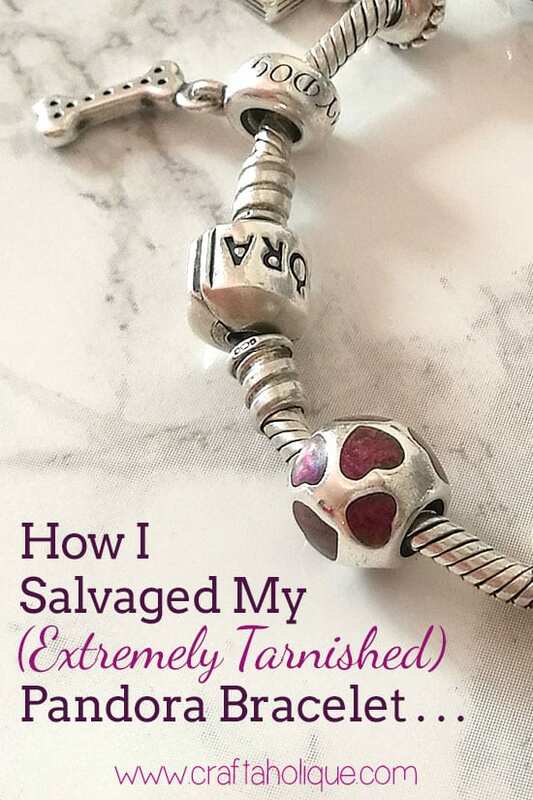 I left the bracelet tucked away in a drawer, until I came across this fantastic article which explained how to remove tarnish from silver jewellery! Please do have a read of it for full instructions and how the process of removing tarnish actually works, once you’ve finished reading my post. Washing the bracelet with gentle detergent and water. Washing it with soap and water. Rubbing with a special jewellery-cleaning cloth. Soaking in lemon juice and salt. Soaking in lemon juice and vinegar. (I’d read somewhere that old fashioned cleaning methods involved lemon juice and vinegar, so thought it was worth a shot!). Here’s what I did that worked…. I covered a small bowl in aluminium foil (could have used an tin foil plate if I had access to one). I added 1 x tablespoon of salt and 1 x tablespoon of bicarbonate of soda (baking soda) into the bowl. I then poured some hot (not boiling) water into the bowl and mixed the salt and bicarbonate of soda together until they dissolved. I removed the charms from the bracelet and put them into the bowl separately as well as the bracelet chain itself. I left the bracelet chain and charms to soak for around 10 minutes before removing. and it just helped to remove any remnants of tarnish. Here’s what my bracelet looked like after cleaning! A million times better! I’m so happy that I can wear my bracelet again! Time to start thinking about future ones to add onto it! I came across this really cute Mickey and Minnie safety chain charm on Amazon, which I’d love because Disney will always hold a special place in my heart. We took our daughter to Disneyland Paris in January and we have lots of amazing memories from the trip. So there you have it, this is how I salvaged my extremely tarnished Pandora bracelet! It’s worth noting that this process shouldn’t be used for jewellery that is made from antiqued silver or if it contains semi-precious or precious stones. If your jewellery is really valuable, then you should consider taking it to a professional jeweller just in case. 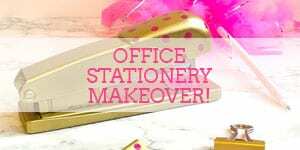 But if you are looking for a DIY home solution, I hope this post has helped you! Like this post? Please take a minute to share this online. 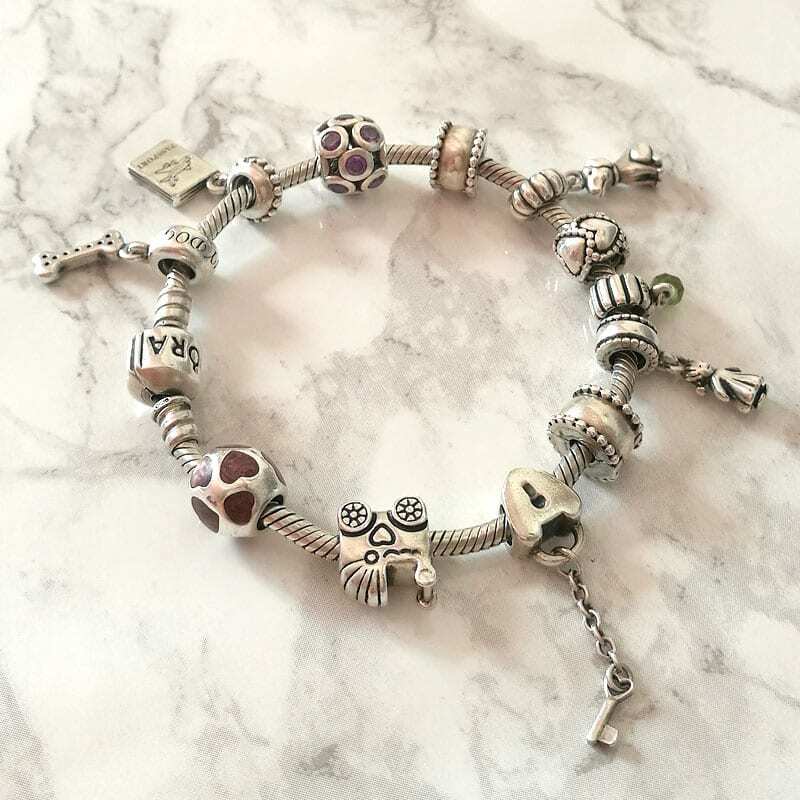 *Pandora bracelet images are the copyright of Craftaholique. OMG! It worked! I’m so happy I could cry! Thank you! What if i dont have the clo cloth is there something else i can use. Hello! You could just try a soft cloth and see if the tarnish rubs off? 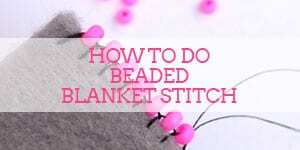 I used a silver jewellery cleaning cloth for mine though – I would recommend trying to get hold of one for best results. Many thanks for the tip, my daughter’s bracelet now looks good as new. Thank goodness for this excellent tip!! Thank you so much for this!!! Saved my necklace!! No worries, glad you found this post helpful! I’m really pleased this post has helped! Thanks so much for stopping by and commenting! How many times did you have to do this to get the results you did? How did you clean your charms? I put the charms into the bowl of solution as well as the bracelet and let them soak. I then polished them with my silver jewellery cleaning cloth! Hi, can you please explain what’s the aluminum foil for? And when to use it? Thanks! My understanding is that the aluminium foil reacts with the silver sulphide on the bracelet (the discoloured bits!). Use it right at the beginning to cover your bowl, before adding any of the solution materials. I’m going to try this as soon as I get home. My bracelet I hope is not ruined as it was a gift. It worked. Thank you so much for this tip. I was so upset when I forgot to take off my ring before going swimming as it was a birthday present from my son. I found this tip on Google. I forgot to take my ring off & went in the hot tub literally just got it & it’s tarnished it’s currently soaking now, fingers crossed it works, so I was glad to see this thread & found out it’s worked for others. I hope it worked for you! I cannot begin to explain my happiness and gratitude to you for posting this. I was devastated that my bracelet was what I thought ruined! I did this and it literally looks brand new! It has such a sentimental value as did yours. Thank you so much for sharing! You’re so welcome! I’m really glad that you managed to salvage your bracelet too! You’re most welcome! I’m glad it worked for you! Thank you so much for this wonderful information! I was in the shower washing my hair with my bracelet on (I NEVER take my bracelet off) and as I was running my hair under the water I noticed that my bracelet had turned an ugly brown! It was silver when I stepped into the shower. I immediately started googling information on how to clean my Pandora bracelet. My bracelet is SIVLER again along with all my beautiful charms!! Thank you, thank you, thank you! Hi Hayley !!!!! The bowl has to be any particular bowl ?? Glass bowl or steel bowl or silver bowl or normal crockery bowl ??? Pls advise before I try this method ….. It can be any bowl as long as you cover it in aluminium foil! It’s the foil that does the trick. My bracelet looked worse than the one you pictured. I wish I would have taken before and after pictures, this method is amazing. Mine did take 2 times. Thank you for the great tip. My mother kept her sterling in zip lock bags to prevent tarnishing. Now that mine are shiny again I’m going to try the zip lock also. You’re most welcome, I’m so glad your bracelet turned out good! How long did you wait before you did it a second time ? Thank you so much for this advice! It totally worked! 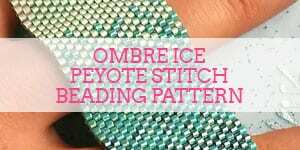 I just found this post and am going to try it on my Pandora necklace. I have been hiding it for about a year and have tried everything that you posted and more! So that is what I am going to do tomorrow. Do you know if it works on silver plate? Hello! I’m not sure if it works on silver plate, I haven’t tried it, sorry! But I hope you have success with your Pandora necklace. I have used this method before and it worked. However, I used this method a year+ ago and I left my jewelry in the solution for too long! I got side-tracked and forgot about it for few hours. I ruined my jewelry. It actually turned black! I was so sad. I had some very expensive silver band bracelets. I put it away and thought it was a big financial loss. Yesterday, I was at Ross Dress For Less and saw a jar of W e i m a n jewelry cleaner for three dollars. I thought, why not try it. To my shock, it removed 90% of the black on my silver jewelry. I used a soft toothbrush to clean the pieces. Then I took some toothpaste and gently brushed it, and now all my jewelry pieces look like brand new. So this is a your tip — if you ever do what I did. Thank you for posting this! I did this tonight and I definitely see a difference. My bracelets need a little more work .. maybe I should have let it soak a little longer ? Didn’t want to go pass 10 mins and something happened .. I want to do it again should I wait some time before trying it again ? Will soaking longer than 10 mins cause problems ? I’m glad this worked for you! I wouldn’t know about the results of leaving it in the solution for longer, although one of the other commenters has suggested that her jewellery turned black when she did this – check out her comment for a great tip on what to do if this happens! To maintain jewellery first of all, keep it away from any chemical or perfume. To clean the jewellery, use tooth paste and rub it or you can use milk or washing powder. You can also use the dry or wet cloth for cleaning. I’ve been looking for something to clean my Pandora bracelet for over7 years…This actually really worked! The only thing before this that had given any results worth mentioning was crest toothpaste. I use it to clean everything from costume jewelry to my fine jewelry pieces. (Add a clear coat of fingernail polish to the costume jewelry after cleaning it. No more “green” spots on your skin giving away the fact it’s not real. Thanks so much for saving my Pandora bracelet! Pandora will actually clean your bracelet free while you wait! Only takes a matter of minutes. Thank you so much ! I had put my Pandora bracelet in a box after ruining it with silver jewelry cleaner. Now I’m wearing it with pride and ordering more charms. Think I’m going to try this on a couple of silver chains that have dulled. Thanks again!! Keep us posted if you come up with any more tricks! I am devastated!!!!! I made the WORST mistake ever by leaving my Pandora bracelet in jewelry cleaner for several hours. When I removed it, all I could do was cry. I don’t know why I didn’t do research on how to clean silver before putting it in the cleaner. My bracelet and charms are so severely tarnished that they look like a dark brass or dirty gold color…every one of the charms looks beyond repair. My only hope is to try this and see what happens. I’m praying and crossing my fingers. The foil needs to be shiny side up for the chemical reaction to work best. My favourite place to shop handmade! Craftaholique is a personal blog. The content you'll find here is for your entertainment purposes only. Craftaholique is a participant in the Amazon Services LLC Associates Program, an affiliate advertising program designed to provide a means for sites to earn advertising fees by advertising and linking to www.amazon.co.uk and www.amazon.com. Read the full site disclaimer here.